Yasmini, Vera (2005) Dimensi Orientasi Religius Dan Gejala Depresi Pada Remaja Akhir Beragama Kristen Protestan. Skripsi thesis, Universitas Tarumanagara. The study aim is to find out the relationship between the dimentions of religious orientation and symptoms of depression in Christian late adolescents. Religious orientation consists of intrinsic orientation and extrinsic orientation. The subjects consist of 32 christian late adolescence from SMUK K.K in Jakarta Barat and SMUK X2 in Jakarta Pusat. The subjects ages are 15-18 years old. Data is obtained by using questionnaire. From intrinsic orientation, the result is r(30) = .305, p > .05 which indicates that there is no relationship between intrinsic orientation and symptoms of depression. From extrinsic orientation, the result is r(30) = -.130, p > .05 which indicates that there is no relationship between extrinsic orientation and symptoms of depression. 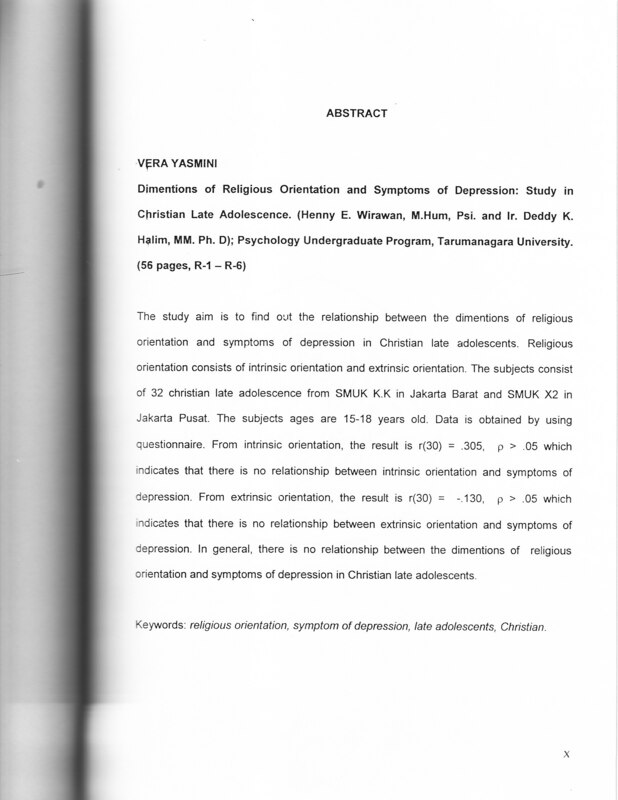 In general, there is no relationship between the dimentions of religious orientation and symptoms of depression in Christian late adolescents. religious orientation, symptom of depression, late adolescents, Christian.